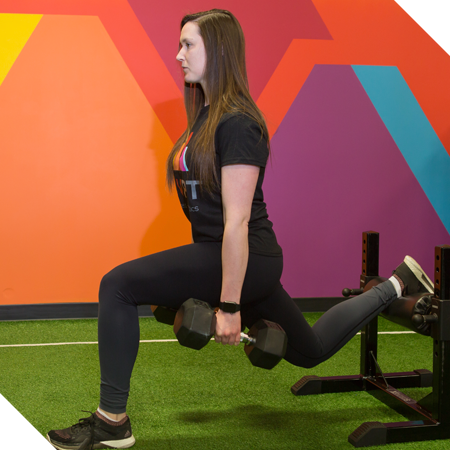 Brittany’s involvement in sport really sparked her interest in human movement and ways to improve her fitness. After completing her degree in kinesiology, she fell in love with helping individuals improve their performance not only in sport, but also in everyday lifestyle. She has had the opportunity to work with a large scale of athletes from a variety of sports and competitive levels. As well as those everyday individuals looking to improve their lifestyle through fitness. Her experience in training includes strength and conditioning, power development, speed development, and recovery methods. Brittany has trained one on one, small groups, and large groups, such as sports teams. This past hockey season she wanted to be closer to the action and took on the role of team trainer for a Major Midget AA Boys hockey team. She still actively plays competitive soccer, and is often called the “Fitness Nerd”. Brittany enjoys working with all individuals, no matter their fitness level. Whatever your goals, she will work with you to help you move better and feel better. From hockey players to soccer moms, from ages 6-60, it is never too early or too late. Proper movement and form before anything else is key. Each individual is different in the ways they move and in their strengths and weaknesses. If you want to perform well, the small details will make a significant difference in ensuring you are getting the most out of each exercise and your workout overall, as well as preventing potential injury. Brittany is constantly searching for opportunities to increase her knowledge in order to continually improve and help her clients successfully reach their full potential. Single Leg Squat, especially with dumbbells. Brittany really enjoys the challenge of this exercise because it involves balance, core strength, good posture, and grip strength.